This is the review after seeing ‘Endhiran’ twice here in iMax Prasadz. Actually it was a nice experience to see “Endhiran” on opening day. But the response was similar to a theatre in Chennai. We had a huge crowd here also. I have seen many movies on the opening show here. But total theatre will maintain silence. 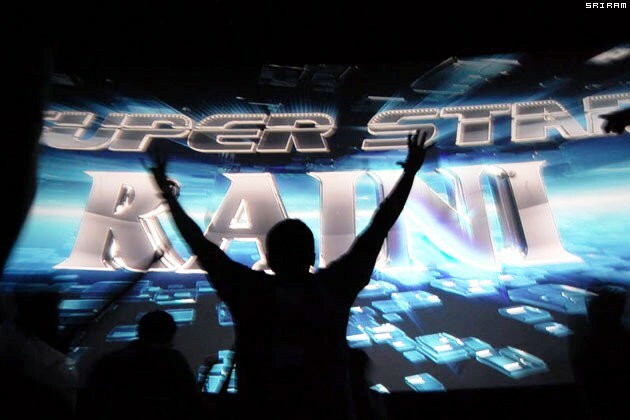 But only for Superstar’s movie I have seen whistles and dances and all sort of things. Being a biggest ever budgeted Indian Movie by Sun pictures Kalanidhi Maran, directed by Shankar, Music by AR Rahman, Endhiran crossed the box office hit of an Bollywood movie. Endhiran is completely different than his other movies. Because hero enters into screen without any action scene. Total movie is dragged by Shankar and not by superstar. Dr. Vaseegaran(Rajni) creates a robo which has all capabilities other than human feelings. feelings and it can’t be used in army to kill enemies fearing it will kill our own people unklnowingly. In the mean time, Bora also tries to develop a robo which will be used for mass destructions. So, illegally deals with some fellows and gets a contract to create 100 similar robots. So he is getting help from Rajni’s assistants Santhanam and Karunas. Due to its failure in approval process, Rajni decides to give feelings for chitti and he trains it. And mutually it gives problem for Rajni. Because of that it also starts loving Sana. After sometime, Chitti starts arguing with Vaseegaran for Sana. Using this Bora tries to pull Chitti by his side. In no way, Vaseegaran gets angry and brakes Chitti into pieces and throws it. Then Bora helps Chitti and creates its version 2.0, then the action sequences comes into the second part with Villain Chitti. Chitti kidnaps Sana from the marriage hall and fights with everybody. It clones itself exponentially. We can see old villain Rajni, which is very much suitable for him. In that fight, vaseegaran atlast controls Chitti and brings it back to his control. The last half an hour is full of graphical sequences which is first in any indian cinema. Really it was a nice try from an indian director. The story ends with Chitti dismantling himself. Being a Rajni’s fan I am really proud on seeing this film. Nobody might have expected Rajni will be having this much mass around the globe. It has crossed many mile stones in indian cinema. Nobody can say he is popular only because of his style and punch lines after seeing Endhiran.